Before I start to recount my experiences I should issue a disclaimer. You see, I couldn't actually manage to get an interview, per se. This close to Jhudora Day all of her minions had either already been summoned or were way too busy completing their various tasks to have time for something as inane as an interview. This explains why I found myself at the bottom of Jhudora's Bluff huddled with a group of pets with one thing in common. For one reason or another, we all intended to complete the treacherous climb to the top. My rationale you ask? If the minions won't come to Lilithium, Lilithium has no choice but to go to the minions. I took a look around making note of the varied company in which I found myself. As expected, the Jhudora fans were out in their numbers, resplendent in the trademark purple wig with green highlights. They made up the majority of the group but they were quite a few others. Some of them were pacing impatiently and others stood with determined expression, one even looked rather sick. I was about to inquire after his health when a woodland Acara stepped around the corner. "Alright, gather round, pets," she stated, adjusting her black framed glasses. "My name is Audry and I'll be your guide this afternoon. For those of you who've never done the climb before, please note that you do so of your own free will and Jhudora is not liable for any damages to property or person. Please write your name on the sign-in sheet; this indicates that you understand and agree." She passed around a clipboard and the assembled pets wrote their name one by one. I made sure I was the last one to do so and handed it back to Audry with a smile. "Hallo, my name is Lilithium. Would it be okay to ask you a few questions on the way up?" I inquired. "No problem," she replied, before going over the sheet. Satisfied that the number of signatures corresponded with the number of persons present, she headed back the way she came. "Okay guys, follow me," she called over her shoulder. "Try to step exactly where I do, never take your eyes off the path, and whatever you do... don't look down." Being an experienced world traveler I am no stranger to climbing. However this, as our intrepid guide was quick to remind us, was no mountain. The tree was simply immense and its bark had been worn smooth by the passage of time and, no doubt, hundreds of feet. This resulted in a surface on which every step was a slip waiting to happen, and the ground was very, very far away. The woodland Acara moved slowly but steadily and I suspected the slow pace was more for our benefit. She appeared to be sure-footed and quite confident as she placed one paw after the other. Concentrating on my own foot placement, I decided it was time to start with my questions. 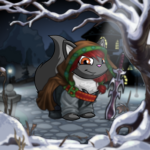 "So, how does a woodland Acara end up working for Jhudora?" I inquired. "Wouldn't helping out Illusen suit you better?" "That's actually a very common question, Lilithium. People see a woodland pet and figure, well, of course she'd prefer to work with Illusen. Nature type neopet, earth faerie... match made in Faerieland, right? Thankfully though, Jhudora doesn't discriminate when it comes to colour. My temperament is much more suited to Jhudora anyway. I don't know if I could handle the whole do-gooder vibe over at Illusen's." Audry looked back with a grin. "You should probably watch your step there, it's tricky." I carefully navigated the difficult area, extremely thankful for every one of my four feet. Judging from the occasional gasps and shrieks of alarm coming from behind, the bipeds weren't having an easy time of it at all. "Okay. You say you are more suited to Jhudora temperament-wise, but what exactly does that mean? What type of personality do you need to enjoy working with the infamous Diva of Darkness?" "Diva of Darkness?" Audry giggled. "I'll have to add that one to the list. You'd be surprised at the number of titles she's amassed over the ages. To answer your question though, one of the most important qualities a minion of Jhudora can have is a lack of fear. Jhudora can be very intimidating so if you are overly timid you won't be of any use at all." She glanced back over her shoulder to see how her charges were doing. "Keep it up, guys! We're almost there!" The fan girls burst into excited chatter at this announcement and the nervous energy grew until it was almost tangible. Audry smiled at the general sense of excitement among the group before focusing once more on the last section of the climb. "Another requirement is a sense of mischief. You really need an appreciation for pranks or you won't last longer than a snow puff in Moltara." "Interesting use of imagery there, Audry," I said with a laugh. "What does a Minion of Jhudora do? Are there any particular tasks you're expected to complete? Besides leading the trek up to the bluff I mean." "Well Lilithium, you're about to find out," she said, climbing up the last few meters and stepping over the edge. "Welcome to Jhudora's Bluff." Following Audry's steps I pulled myself up to stand beside her on the cliff. There was another chorus of gasps from the others as they arrived but I was fairly sure these were in awe. The whole of Faerieland lay spread out before us in a panorama of verdant trees and glistening rivers. The city itself seemed close enough to touch. "Gets them every time," Audry boasted. She gathered everyone close for another headcount. "Didn't lose a single climber this time, great job, everyone!" I waited until the round of cheers had finished to ask, "Does that happen often? Losing someone I mean." Audry shrugged. "Every once in awhile we get someone missing a step and falling to their doom." She leaned closer. "The branches are actually spelled to save anyone who slips off, but Jhudora doesn't want it becoming common knowledge... it would reduce the amusement factor." Audry turned and headed towards the castle which was pretty impressive itself, despite its semi-ruined state. I clutched my jacket tighter around my shoulders and followed. If I thought the air at the bottom was chilly these blasts must have come straight from the top of Terror Mountain! I felt quite sorry for the fan girls in their thin Jhudora tees. When we reached the gates Audry came to a stop and addressed the group once more. "We have arrived at our destination. Those of you here to tour the grounds, please assemble to my left." With that announcement the fangirls (and quite a few boys) grabbed their banners and balloons and gathered as directed. "Questers, you know the drill," Audry stated, looking at the others. The impatient individuals I had noticed earlier headed off to what I assumed was a side entrance, a few of them doing some last minute strategic planning as they went. One of them hesitated, the same young Xweetok that had seemed so ill before. Audry gave him a once over. "First time doing one of Jhudora's quests?" she asked gently. The boy nodded, eyes huge and earnest. "Go through the side gate and around the back. Head through the open door and take the second left into the waiting room. Everyone else should be there. She'll call you when she's ready." The boy scampered off in the direction the others had gone. Audry walked over to the fence and twisted one of the spikes. A couple seconds later a royal girl Hissi with a bartamus perched on one shoulder slithered into view. "Hey Audry, I went ahead and groomed the grussies while you were out. Daisy's coat was a mess but Sarah's tusks only needed a little oiling." Audry nodded her thanks and petted the bartamus riding on the Hissi's wing. The finicky critter hissed it's appreciation before snapping at her paw. Audry only laughed and the crowd cooed as though it was the cutest thing ever. "First stop on the tour... the bartamus pens!" called out the Hissi, as she led the tour group away. "Wait a second, aren't you here for the tour?" asked Audry, looking quite puzzled. "No need," I replied with a smile. "I have more than enough."